Why Does it Matter if Almonds are “Truly Raw”? Why Should You Soak and Sprout Raw Almonds? How Do You Sprout Almonds? 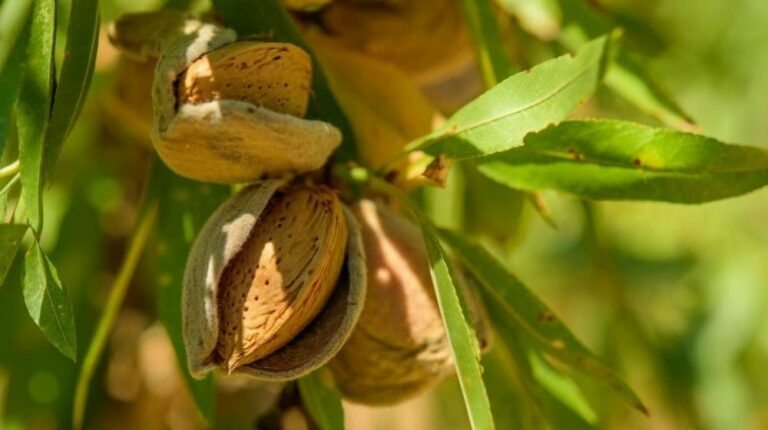 California has forced almond growers to pasteurize all their nuts above 130 degrees. This steam process not only blunts the almond flavor, but it also kills enzymes, which are destroyed at 118-120 degrees. But since there is no legal definition of “raw” when it comes to food, retailers can sell pasteurized almonds and still call them “raw almonds,” because they aren’t roasted, not because they are actually raw! 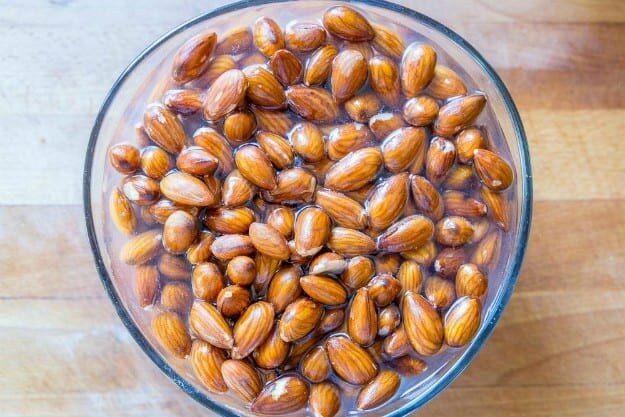 You want truly raw almonds for their superior taste, live enzymes, and so you can soak and sprout them. Pasteurized almonds are “dead” and won’t sprout! Enzymes Multiply. The water signals to the almond (which is actually a seed rather than a nut) that it is time to grow. To grow, seeds have to turn off their natural enzyme inhibitors, and rapidly increase the enzymes needed to sustain a growing plant. These enzymes then become available to your body when you eat sprouted almonds, improving your digestion and other bodily processes. Minerals and Vitamins Increase, the B vitamins in particular. Growing plants need B vitamins and their mineral partners to metabolize carbohydrate for energy, which also means that when the almonds are soaked or sprouted, these vitamins and minerals become available for our body to absorb. Carbs Decrease. Seeds are their own energy source, and they use their carbohydrate to produce the energy they need to sprout. Oxalates are Reduced. People who are sensitive to oxalates can enjoy more raw almonds simply by sprouting them! Bioavailable Nutrients are Unlocked. Amino Acids and other nutrients “unlock.” They become more bioavailable, as well as increase. The Taste Improves. A sprouted almond has an even more nutty, almond taste than raw. If you’ve been eating pasteurized almonds (which you almost certainly have, since raw almonds take effort to find), you are missing out on taste! 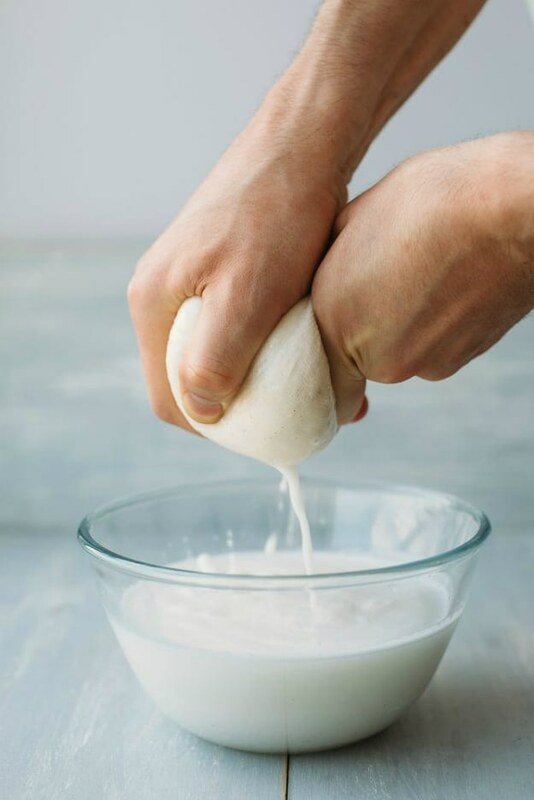 Once you sprout your raw almonds, you can use them to make delicious, homemade almond milk! Raw almonds need about 12 hours of soaking in water, at room temperature, to start the sprouting process (I usually soak mine overnight). You don’t have to soak them long enough to see the nub of the sprout poking through the skin (that would take days, and often the nut will mold first). Just be sure to give the almonds at least 12 hours in the water. Remember, pasteurized almonds won’t sprout, no matter how long you soak them! Sprouted almonds can then be used to make almond milk or in almond recipes, or preserved, live enzymes intact, by drying them in a dehydrator for several hours at 110 degrees. I’ve got a bunch of yummy recipes for you to try with your sprouted almonds (my Almond Joy Fudge is to die for)! A serving of raw almonds (one ounce, or about 23 almonds) has 160 calories, 6 grams of protein, 3.5 grams of fiber, and 14 grams of heart-healthy fats. A great snack that can sustain you for hours! Almonds are famously high in monounsaturated fat, the LDL-lowering fats associated with heart health. A recent study published in the American Journal of Clinical Nutrition found almonds, when substituted for more traditional fats, can reduce cholesterol levels as much as first generation statin drugs! 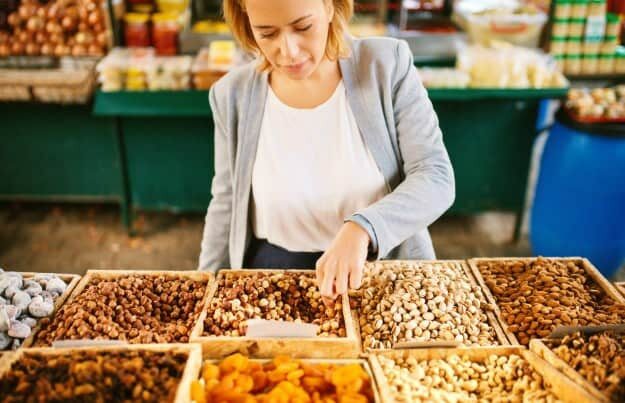 Researchers from the Nurses’ Health Study (one of the largest longitudinal health studies ever) estimate that replacing nuts for an equivalent amount of carbs cuts heart disease risk by 30%. But even more impressive is substituting nuts like almonds for saturated fat (as in dairy and meat)–the disease risk goes down 45%! Almonds have a great electrolyte balance, with 162 mg potassium and just .2 mg of sodium per serving. The high potassium-to-sodium ratio lowers blood pressure by drawing more fluid out of the bloodstream and into the cells. High magnesium and potassium in almonds keep blood and oxygen moving to muscles and help regulate the electrical signals that contract those muscles. They also help blood vessels and muscles relax, so oxygen and other nutrients can feed cells and prevent cramping. Meals featuring almonds have been shown to cut surges in blood sugar, as well as increase antioxidants. Both factors are important in preventing and controlling diabetes. Almonds have high vitamin E levels, a nutrient responsible for keeping organs–including skin–supple and functioning well. Almond oil has been a treasured skin protectant and moisturizer for millennia. Along with Vitamin E, researchers have found that almonds have a unique combination of bioflavonoids, particularly in their brown skins. The synergistic effect of the flavonoids with Vitamin E serves to prevent cellular damage and help cells regenerate and repair quickly. Cellular energy production requires trace mineral “triggers,” such as copper and manganese, which are found abundantly in almonds. The B vitamins and antioxidants C and E also assist in energy production. The even better news is that sprouting raw almonds greatly multiplies the amount of all these nutrients! Many people avoid nuts for fear of weight gain, which turns out to be baseless. A study comparing overweight people eating a low-calorie, high-complex-carbohydrate diet, vs. those eating a low-calorie, almond-rich diet, showed the almond-eaters to have a 56% greater reduction in body fat, 50% greater reduction in body fat, and a 62% greater reduction in overall weight! Other studies have shown that people who eat nuts like almonds twice a week are less likely to gain weight than those who never eat them. The Nurses’ Study showed that women who ate just 1 ounce of nuts per week (just 28 almonds!) lowered their risk of gallstone formation by 25%. The high percentage of the antioxidant vitamins E and C are natural free radical scavengers, reducing inflammation and preventing DNA damage to cells and tissues. A year-long study found that people eating 2 ounces of almonds every day (and given no other guidelines) naturally gravitated toward eating more nutrient-dense foods, and fewer nutrient-poor, high-sugar foods. Remember, your chance to get truly raw, sproutable almonds, direct and fresh from the grower, ends with Group Buy on November 30! You can freeze any almonds you won’t be using in a few weeks’ time, and still keep their live nutrients intact. Get enough to last you the year! You can find more raw almonds nutrition benefits in 12 Steps to Whole Foods! The 12 Steps Masterclass is currently open and free for a limited time. Editor’s Note: This post was originally published on November 9, 2017, and has been updated for quality and relevancy. i most definitely want to use your group buy. i would like to know what type of containers the almonds, coconut oil & olive oil come in… i need to make sure we have a place in our home to store them all safely & be able to withdraw smaller amounts as needed in a safe way to make sure the bulk batch won’t be contaminated. Do you need a freezer to store the almonds? You can store the Almonds in the freezer (indefinitely) yes, but also in a fridge for a few months is fine. You will need some sort of bags or containers, gallon ziploc bags work great, for the almonds as they come in a big box. The coconut oil is in a big plastic bucket and the olive oil in a plastic jug. I purchased raw almonds at bulk and had a hunch they were pastuerized with PPO (propylene oxide) a fuel banned by the National Hot Rod and American Motorcycle Racing Association because of it’s toxicity. Called head office and indeed they were. How can they market them natural? Michele that’s because “natural” is an unregulated meaningless word. “Raw” in Retail stores just means “not roasted.” Can be pasteurized and labeled raw! Often the nuts you buy in the store that say they are raw just means they aren’t roasted, not truly raw. But our almonds are raw and are just short of being certified organic, and are as close to organically grown you can get from the farmer. Our grower uses a non-toxic pesticide that does not hurt bees, and it is safe enough that the people who apply it do not need to wear any protection. It is applied twice a year. I would love to purchase some almonds in the group buy. Do you know how they should be stored? I’ve bought from farmsin california before and they suggest storing them in the refrigerator. If so I need to make sure I don’t buy too many, but I’d like to purchase 100lbs. Maybe vacuum sealing could be effective? You can store them in Ziploc bags in the fridge for a few months and in the freezer indefinitely. Are these raw almonds organic or at least pesticide-free. I don’t want any glysophate on the almonds. These almonds are just short of being certified organic, and are as close to organically grown you can get from the farmer. Our grower uses a non-toxic pesticide that does not hurt bees, and it is safe enough that the people who apply it do not need to wear any protection. It is applied twice a year. No glysophate. Do you know if the almonds have any cross contamination with peanuts or other tree nuts? I have a daughter with a cashew and peanut allergy. Thank you. I bought these ‘group by’ almonds and was disappointed in the taste. They are okay before soaking but after soaking they have a bitter taste (from the brown skin which cannot be removed on these almonds). So I generally don’t soak them. If soaked, I would put them in a smoothie to cover up the ‘bad’ taste. 1st time doing the group buy. I am storing my raw almonds in my deep freezer. I will primarily be using them in smoothies. In small amounts; after soaking for 12 hours, how do I store them, (in a jar in the fridge?) and for how long? I’m hoping I don’t have to soak them every night for the next mornings smoothie. And I’m not planning on dehydrating them. Thank you. Hi Karen – Congratulations on making a group buy purchase! These almonds are beautiful and delicious! Typically, we recommend soaking almonds for at least 12 hours and dehydrating for 24 to maintain freshness. If you’ve already popped our almonds into the deep freeze, I’d recommend taking out what you need for a week’s worth of smoothies, soak them and store them in the refrigerator. The other option is to take out a gallon bag’s worth of almonds from the freezer, store them in your refrigerator as they can be stored for weeks in there, and get into the routine of sprouting 12 hours prior to making your smoothie. I hope this helps. Thank you so much. The info I was looking for!! !